These Thanksgiving trivia questions will be loads of fun at your holiday dinner. 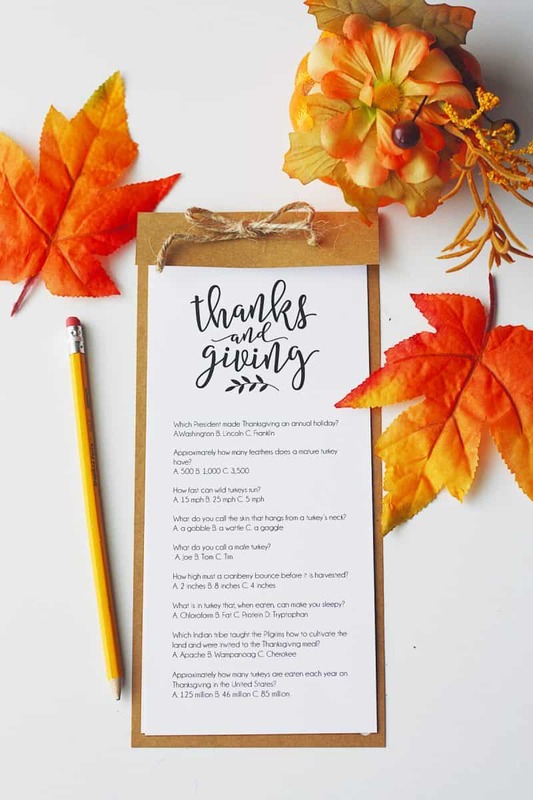 Test your guest’s knowledge of Thanksgiving facts with this cute Thanksgiving trivia quiz. We also use these conversation starters. 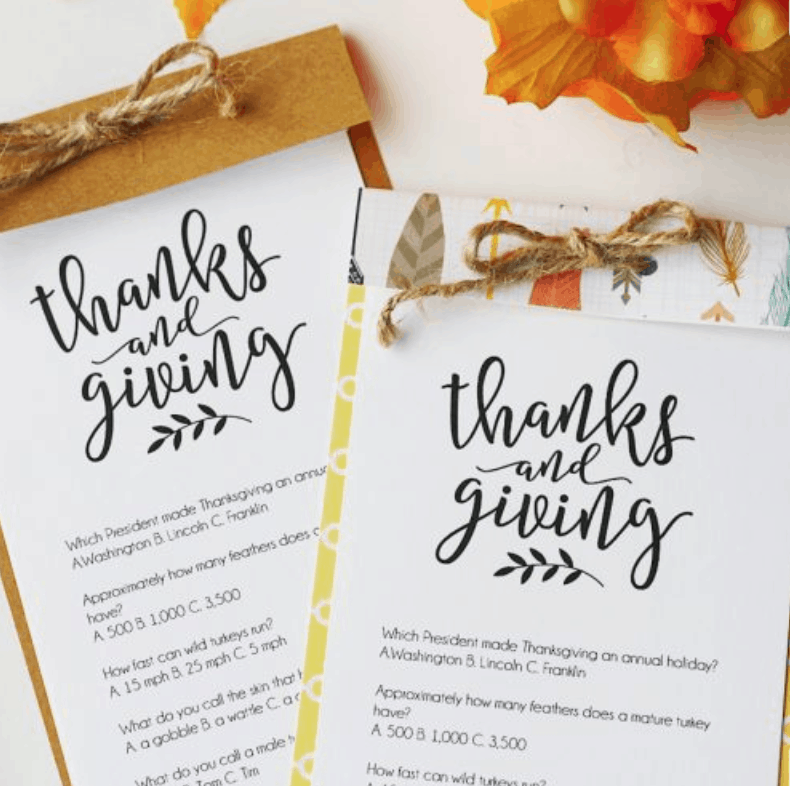 Print out the Thanksgiving Trivia printable and cut it in half. 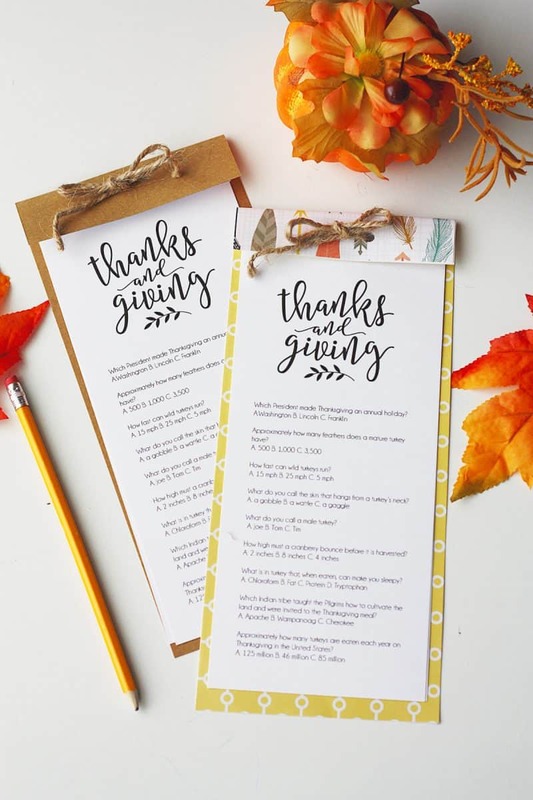 There are two sets of Thanksgiving trivia questions and they print out on 1 page. To make your game a little more festive, you can cut out kraft paper or scrapbook paper so that it’s just a little bit bigger than the printable. Fold down the top part of the game so that the answers are hidden. Do the same with the kraft/scrapbook paper so that it covers the top of the page. Hole punch the top with two holes and add a ribbon or string to hold it all together. Not only is this game fun, but it also looks cute, and your guests will never know that the answers are right in front of them! Make the game a little more competitive and include a prize for the person that gets the most answers correct! So while you are chowing down on mashed potatoes and pumpkin pies at your Thanksgiving feast you can play a round of Thanksgiving trivia. Which President made Thanksgiving an annual holiday? Approximately how many feathers does a mature turkey have? How fast can wild turkeys run? What do you call the skin that hangs from a turkey’s neck? What is in turkey that, when eaten, can make you sleepy? In what year did the first American Thanksgiving take place? What is another name for a turkey’s wishbone? How fast can a wild turkey fly? Where was the first Thanksgiving held? If your guest blow through those trivia questions here are a few more to Thanksgiving facts to test their knowledge. While it is estimated that 88% of Americans eat turkey and 94% cranberry sauce at their Thanksgiving dinners it looks like sides vary greatly from state to state. 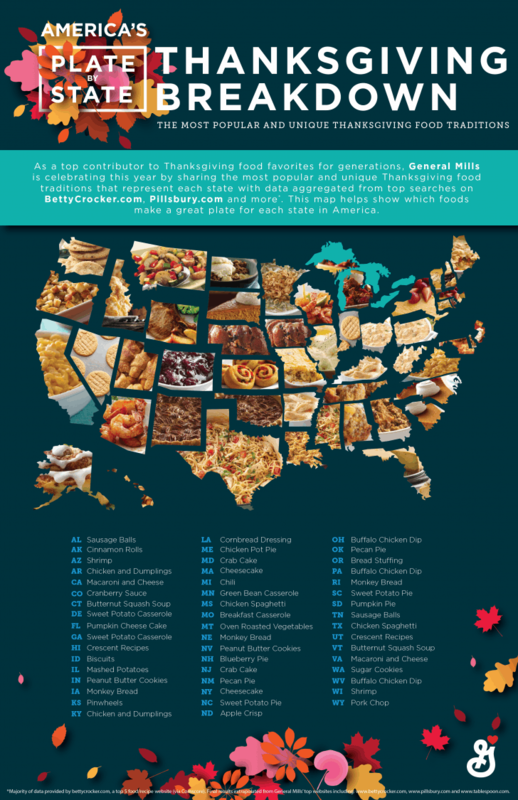 Check out this map from General Mills. Where’s the green bean casserole? I really thought everyone ate that on this National Holiday! I didn’t know people ate Monkey Bread on Thanksgiving Day! Cranberries, corn, and mashed potatoes were not served at the Pilgrims Thanksgiving meal. Virginia was the first southern state to adopt a Thanksgiving Day in 1855. The Pilgrims did not use forks to eat their Thanksgiving dinner. The thigh is the best place to put the meat thermometer in the turkey to see if it is done. Harry Truman in 1947 is believed to be the first to pardon a turkey and start this annual tradition. The Pilgrims who came to the New World seeking religious freedom were also Puritans because they wanted to purify the teachings and ceremonies of the Church of England. The First Thanksgiving, feast between the Pilgrims and the Wampanoag Native American Indians at Plymouth Colony contained waterfowl, venison, ham, lobster, clams, berries, fruit, pumpkin, and squash. 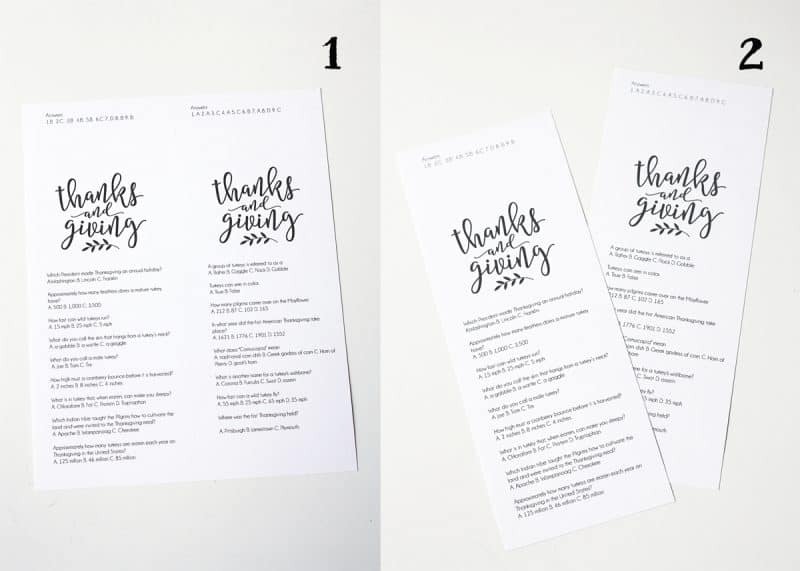 If you are looking for more fun ways to entertain your guest these would you rather questions are always fun! Playing the newlywed game is also hilarious entertainment. These Thanksgiving trivia questions will be loads of fun at your holiday dinner. 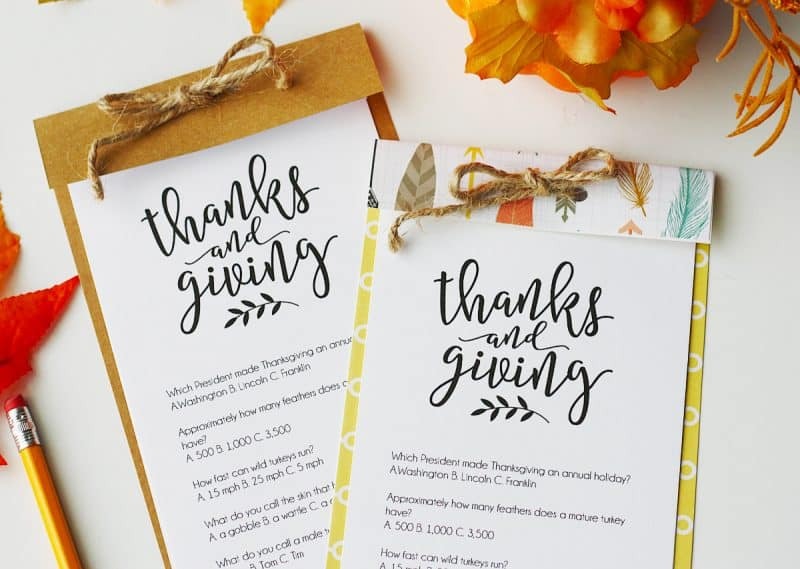 Test your guest's knowledge of Thanksgiving facts with this cute Thanksgiving trivia quiz. I just want to say THANK YOU! I copied your Thanksgiving Trivia game and also Would You Rather game for my family of 4 on Thanksgiving and they both were a hit! The winner of trivia didn't have to do dishes which is big for a 19 and 16 year old! Im new to your website and I am so happy I found you!!! I am glad you loved them. What a great idea for a prize. First off, thank you SO MUCH for sharing this. We lost our mom 18 weeks ago today after a 2 year battle with colon cancer and this will be our first major holiday without her. I've been trying to come up with something fun we could do to kind of lighten the mood and this is perfect. I do have a quick question . . . . I'm having trouble figuring out how to punch holds in the top without punching through the answers when I fold them over?? Any ideas or am I missing something obvious. Thanks! Happy Thanksgiving! 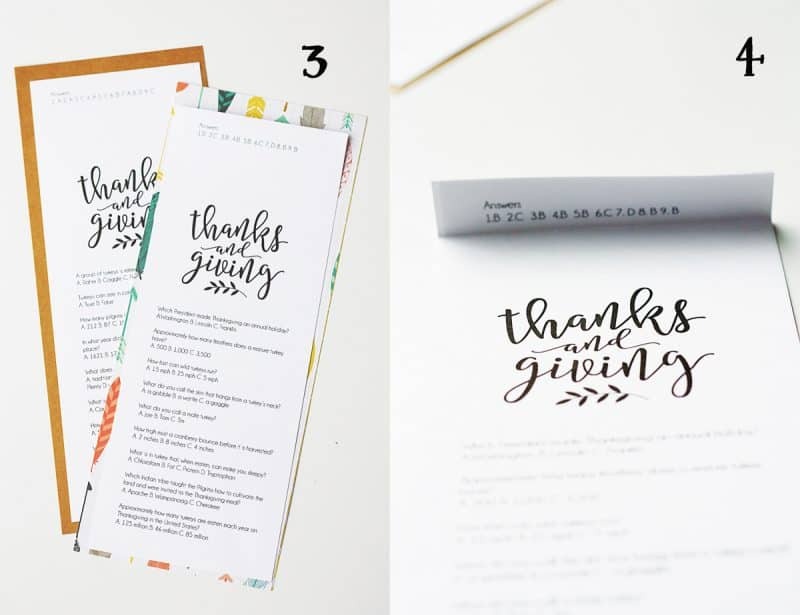 Try folding the decorative paper down a little farther, it doesn't have to totally catch the questions, just enough to have it stay in. Also, you might try a smaller hole punch. I love this idea! Our family LOVES games and especially Trivia!! Thank you! Great idea. Can't wait to share at Thanksgiving.